Composer Andrea Occhipinti is working on the soundtrack for an upcoming horror film and takes up residence in a large isolated villa in order to set the perfect mood. 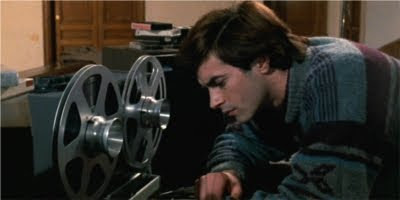 When the disappearance of two female neighbors coincides with his discovery of a strange voice on a finished musical reel, it becomes evident that a murderer may be stalking the grounds. When no one believes his suspicions, the composer is thrust into the role of amateur detective in order to discover the truth. Filmed originally as a television mini-series, Lamberto Bava’s giallo-slasher hybrid was instead released theatrically due to its gruesome death scenes, including the brutal bathroom murder of Demons’ Fabiola Toledo. Although suffering from a slow-moving pace at times, A Blade in the Dark contains a suspenseful build-up and a feeling of growing unease, accentuated by Guido and Maurizio De Angelis’ superb soundtrack, which is used simultaneously as the music for the film and the film-within-a-film. The English-translated dialogue is strangely amusing, with some of the most ridiculously bad lines ever dubbed, which seems to add to the film’s charm. Look for appearances from Italian horror regulars Michele Soavi and Giovanni Frezza.